I think the title of this article is pretty self explanatory, what could be clearer than a triple negative? What I’m saying is that a lack of news doesn’t mean that there is no news… quite the opposite really. Often times no news is news of nothing, in this case that of course refers to the banned and restricted list changes which are announced the Monday before every new set’s release. 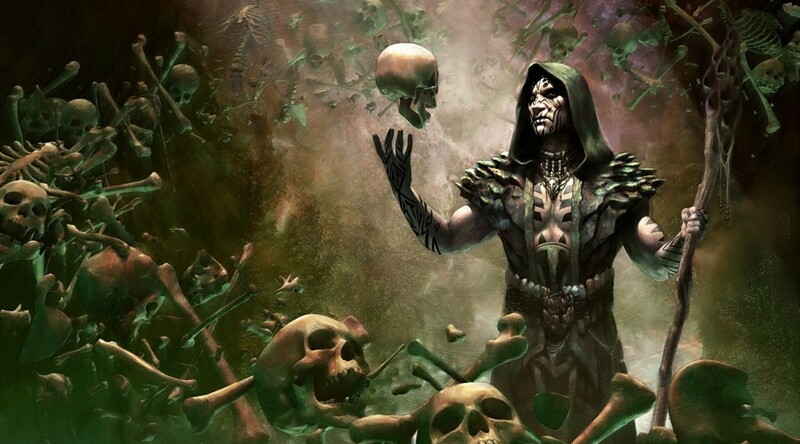 Banned and restricted list changes have become a main attraction within the #mtgfinance community ever since we saw our dear friends Stoneforge Mystic and Jace, the Mind Sculptor get kicked out of Standard. Since then we’ve watched the B&R changes with an eye for opportunity. With the flick of a switch, Wizards is capable of propelling an archetype up from tier 3 to being an actual contender or propelling a struggling prospect to format staple. Like what for example? While Deathrite Shaman was leading Jund, and eventually Birthing Pod decks, to oppressive victories in Modern it was also having the peripheral consequence of making Snapcaster Mage a lot less powerful in Modern. 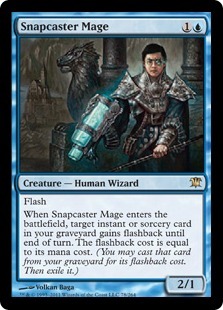 When Deathrite was banned, we should have seen the signs, within a couple of weeks Snapcaster jumped up over 60 percent. No changes to the Banned and restricted list is sometimes as telling as the words “Deathrite Shaman is banned”. For weeks we’ve heard a rumbling crescendo of players calling for bans in Modern. The three main offenders were Splinter Twin, Goryo’s Vengeance, and Amulet of Vigor. 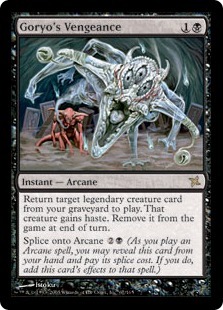 We’re fairly safe in assuming that Wizards has no intention of banning Splinter Twin after including it in Modern Masters 2015 and even going so far as to add another creature that combos with it in Bounding Krasis. In addition to that, the reality is that the deck just slots in Kiki-Jiki, Mirror Breaker to do the same job as most Twin decks aren’t hard pressed to kill on turn four every game. Amulet of Vigor is a deck that received a lot of high profile attention, mostly due to the efforts at one exceptionally adept pilot… that happened to be cheating. Combo decks generally perform much better when you get to pick your starting seven. Despite being an “impossible to stop” combo deck that wins so easily through countermagic, this deck hasn’t really put up any real results. 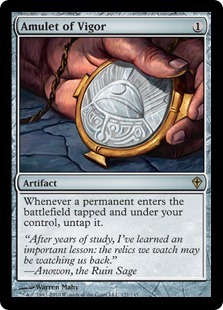 Amulet of Vigor is akin to the Second Sunrise decks we saw a few years ago, too complicated for most players to play… but this time we have the benefit of it not taking 30 minutes for our opponent to screw up the sequencing. Goryo’s Vengeance is a Magic card. It’s been around for a few years with various builds floating in the wild. 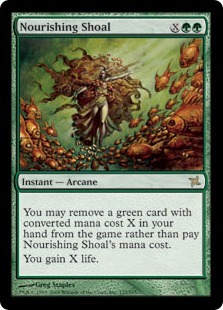 It wasn’t until recently that the Nourishing Shoal tech was added into the fold. This ensured that players weren’t required to successfully attack and cast Fury of the Horde repeatedly to win the game, now you just give some lands to your favorite cyclops friend and he’ll throw them at your opponent’s face. Despite Goryo’s popularity (it even has it’s own hashtag #Griselbanned), the deck hasn’t won any major events and has merely showed up in some diverse top 8s and top 16s. The argument that’s been made about these last two decks is that the deck’s are “too fast” for Modern because they’re occasionally able to win as early as turn two. But if that’s our only metric for banning, expect a lot more in the pipeline. 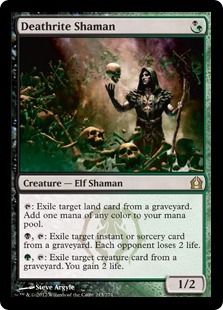 Glistener Elf is quite capable of ending things on turn two, and there are a lot more combinations of cards that get there in infect than there are these other two decks. The other prevailing theory is that Wizards is just going to tie (un)bannings primarily to the Modern Pro Tours. Many claim that Modern just isn’t a compelling format for Pro Tour viewers and that the only way to “keep it interesting” is to cause a shakeup right before the event with (un)bannings. I disagree that shaking things up right before the Pro Tour leads to any kind of real innovation, it’s generally going to lead to players retreating to “safe” decks rather than attacking an established format from a new angle. Ultimately what this translates to is the operating theory that Goryo’s Vengeance and Amulet of Vigor are going to be banned at the next Modern Pro Tour. While I don’t think there’s a compelling case for either of these cards to be banned in Modern, the reality is that Wizards does what Wizards does and it doesn’t always make sense. It would be incredibly easy for Wizards to simply just make all Pro Tours feature both Modern and Standard alongside draft to ensure new cards are going to be showcased and still support all their competitive formats. Bottom line: you have at least three months to play with these cards if you want to acquire them, and you have at least three months to deleverage these cards if you’re looking to sell. It’s highly unlikely anything in these decks sees any dramatic movement, but the prices are likely to remain stable and grow incrementally from here on out. There hasn’t been much talk about Modern Masters 2015 lately either, other than the false notion that prices are on the decline. A quick look at the last week’s biggest gains and losses shows basically nothing from the set moving one way or the other. Stability. If your local game stores are anything like mine, Modern Masters drafts are long over… leaving any influx of new product solely to “lottery ticket” fans. Pack supply is very slowly going to wind down as shops sell a couple dozen packs a week until it’s mostly depleted. What does this mean for you? It means that the price of cards in Modern Masters has pretty much stabilized and that you can expect slow upward growth from here on out for the set’s best cards. There’s just not going to be another massive influx of new product to push prices down any time soon. Another set that’s been relatively quiet this week. Typically at prerelease events we get to see new cards in action for the first time and have a better chance to evaluate them. Simply walking around watching games between rounds can give you a general idea of whether or not a card is going to strike a chord with the general population. I saw zero people playing Evolutionary Leap this weekend, which is of no real surprise to me as this card is just extremely complicated in the abstract, especially for casual players. I stand by my theory that this is a card that will require someone to show us the way before it can really take off. This means that the price is likely to continue slipping, which could make the payoff that much sweeter once it does finally break out. 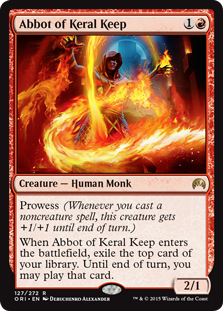 Abbot of Keral Keep was a card that I had my eyes on, especially after opening it as my prerelease promo. I won a number of games on the back of this card and my opinion of it only continues to grow. I’m especially interested in playing this alongside Courser of Kruphix over the next few months as knowing what the top card is before you cast him only makes him more powerful. Even watching other players playing the Abbot gave me a sense that even when he’s really bad… he’s not that bad. If this card didn’t have prowess, we’d be having a completely different discussion; but the extra damage makes him worth a little more than a bear. The Planeswalkers were all pretty impressive, in limited. I’m still having a hard time seeing these in constructed play going forward. At the top tables of the prerelease there was a noted absence of Planeswalkers, the only one that I did see was Jace and the pilot said numerous times that they wish they didn’t have to flip him. “It’s better as a Merfolk Looter” is not a ringing endorsement for constructed play. This weekend we have the usual method of unveiling the new hot fire: an SCG Standard Open. All eyes will be on Chicago this weekend, so make note of what types of decks are showing up in coverage and be sure to pay extra attention to what shows up in the top 32. Many of the format’s new archetypes are going to be in a refinement phase this weekend so tread cautiously. Slotting a Goblin Piledriver into an existing goblin deck is easy…it’s when you get to crafting complicated machines with lots of moving parts that things start to get really interesting. My advice is to see what hype is generated this weekend but don’t get too trigger happy, the second wave of hype will come the weekend of the Pro Tour so your best bet for high prices will be then. I already committed to a playset of FOILs on Pucatrade! And great writing this week about the bannings and Modern decks, you on/off your meds or something?? But can you please shut up about the Abbot!!! lol. You mostly have me convinced about him, but Ire Shaman is unplayable and I have a hard time not comparing the two although Abbot is better. If this card blows up you are about the only person I’ve seen hyping it so much so kudos will go to you. His foil seems like huge boom or bust, I might just scoop up his non-foils and pray for a quick spike. And I still think you are sleeping on Liliana with CoCo and I have plans for her in Esper Control or a Whip Variation but her foil price is quite high right now. Considering she’s “the third best walker” she has the highest foil pricing. Note: I don’t think she’s that great in limited…she’s probably the worst in limited but who really cares. Pass me the pool with the foil lili please 🙂 Alright, take care sir. Keep up the good work. Ire Shaman is an Abbot of Keral Keep that you have to pay twice for, not even in the same ball park. Ire Shaman is genuinely a terrible card, whereas Abbot has potential to be something more in the right deck.